The quiet, rolling farmland of the Maine countryside provides a perfect setting to care for horses. Maine has a long and cherished equestrian tradition that remains a vital part of the state’s identity to this day. It’s no wonder generation after generation chooses to raise their family and ride horses here. What’s also great about these properties is that they are conveniently located within driving distance of cultural centers like Portland, Auburn, and Lewiston, as well as Interstate 95. Scroll down to view horse properties in the Portland and Auburn areas, brokered by the agents here at Meservier. 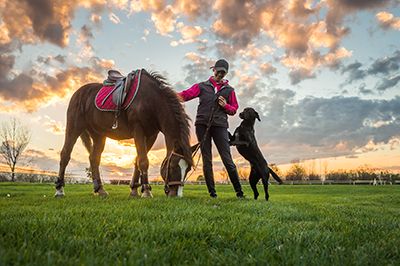 We know equestrian properties better than anyone, so don't hesitate to call us at 207-784-2525 or contact us online for more information or to schedule a private showing. Stunning 1825 Gentleman's farm located on 12.31 acres overlooking Auburn Lake and Mount Sabattus. This completely renovated 4 bedroom, 4 bath home offers all the beauty of a historical home with modern day conveniences. A forty foot great roomboasts views as far as the eye can see and the chef's kitchen is beautifully equipped. The house also includes a stunning en suite master bedroom, large third floor space perfect for a studio or home office, in-law suite, all new systems, windows, roof and solar water system. A former equestrianproperty with ample fields for pasture and a grass riding ring, could be easily brought back to life. Beautiful perennial gardens surround the home. Property abuts the conservation lands of Lake Auburn and includes trails enabling one to take in allthe wildlife and beauty this pristine property has to offer. Just 10 minutes to the City of Auburn and I-95 and less than an hour to major ski resorts, this property is a must see to believe! Endless possibilities at Ridgewood Farms Equestrian Facility. 23+ ac with lush fields & Mt views, several board fence paddocks, huge 18 stall barn w/ auto waters & fans, a 60 x 120 indoor w/rubber and sand footing, restroom & possible apt. There is also a beautiful 100x200 outdoor arena. another pole barn for equipment and several large paddocks. The stunning three-bedrooms, 3 bath home features a spacious, open floor plan W/wood flooring throughout, a sunny and open eat in kitchen with beautiful cabinetry, light fixtures & brick floors. Relax in the cozy FR off the kitchen complete with a fireplace & access to the picture perfect patio w/an in-ground pool & great space for alfresco dining. Entertain in the formal front to back living room or formal dining room. Three spacious bedrooms upstairs with generous closets include a huge master suite w/ensuite bath. This well-known, turn-key equestrian facility awaits you!